Google removed the direct Contacts link on Gmail when it launched the new Gmail interface some time ago. Users of the classic Gmail interface could still open contacts from the main menu; this option is being removed by Google according to a new post on the official GSuite Updates blog. The reason? Google states it is "to create a more consistent, streamlined Google Contacts experience". It is not entirely clear what Google means by that but the most likely explanation is that it removed the Contacts link on the old Gmail Web interface because the new version of Gmail does not have it. Gmail users who open the classic interface right now, it is still possible to go back to it by clicking on the settings icon and selecting the option displayed there, still have access to Contacts for now. It is unclear whether the move affects only Google Suite users or if it will affect all users of the web interface. The change affects all Gmail users. 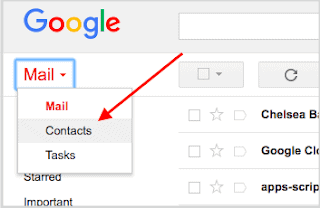 Non-G Suite customers of Google may still see the Contacts link when they activate the down arrow on the Gmail website but instead of loading the Contacts interface, Gmail displays a notification that Contacts is found under the App menu from now on. Contacts, and many other Google apps, can be found under this menu. Google notes that users may load Contacts by pointing their browsers to https://contacts.google.com/ or by clicking on the Google app launcher icon and selecting Contacts from the list of options. The interface that is loaded then is either the new Contacts interface, also know as Contacts Preview, or the classic Contacts Manager. Google re-enabled access to the classic Contacts Manager for all G Suite domains because customers were unaware that they disabled access to the classic version according to Google. 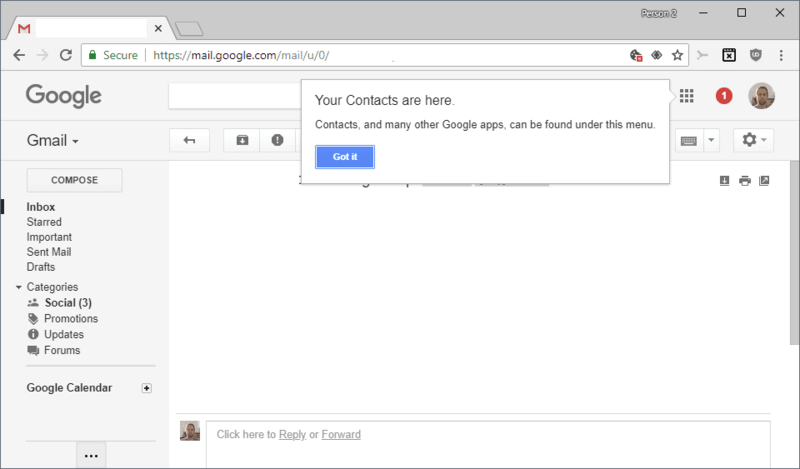 Gmail users who try to open the Contacts interface on the web version of Google's email service receive a notification currently that the link has been moved. Google will remove the link eventually from the interface eventually. Now You: Do you use Google Contacts? Google announced recently that it will remove the Contacts link from the Classic Gmail web interface to streamline the experience. The old UI with the dropdown was always a little weird, but having said that: a link to contacts in a mail application totally makes sense and I have no idea, why they didn’t integrate it in the new sidebar like calendar, keep and tasks. I have no idea, why they didn’t integrate it in the new sidebar like calendar, keep and tasks. Can’t say things are for the better. Wonder if this scenario is also being played on Android Smartphones like S9+. Hi Martin, Since they’ve rolled out the new interface in my location, the Contacts link has remained in the old interface, but it has not worked. When I choose it, I get a pop-up that tells me to access contacts via Google Apps icon in the upper right corner of the GMail interface. They are pushing quite hard for those of us who prefer the old interface to switch. I am reluctant because I’ve heavily customized using Google Labs and other add-ins. I can see my calendar as well as my “Remember The Milk” to-do list as I view the Inbox of GMail. I switched briefly to the new interface the day it was offered and it did away with all of that customization and I saw no way to restore it. I switched back and await them forcing their hand in time. Emphatically no. I see no need to tell Google who my contacts are. So you don’t use an Android phone? Are you an iPhone user? Doesn’t Apple do the same thing? How do you dial numbers? Do you type each one in every single time you call someone? Use an alternative contacts app, or disable contacts sync with Google. Then you manage contacts manually. I use an Android phone, yes, but that in no way means I have to share my contacts with Google. Google needlessly plays around with their interfaces. Contacts is a vital part of email. It should have it’s own icon/link on the main inbox page. The goal of all software should be to decrease the number of clicks to do tasks. Agreed! Google wastes so much time & resources messing around with UI’s and yet they offer some of the most poorly designed UI’s I have ever had to work with. Stop hiding everything Google because you think your UI “looks prettier”. Sheeze. They ought to do some user focus groups on their app UI’s. 1. The inability to sort or exclude apps on Google Play by last update date or number of stars. 2. Or they could work on fixing the awful import/organizing functionality of user music on Google Play. My library there encompasses around 1200 CD’s. But what a mess! Google shows hundreds of my CD’s with album names but only one or two songs on the CD. What happened to the other songs??? Google ignores the questions I and others have posted on the group related to this area. And forget about sorting by genres, Google makes a total mess of that function. No. My contacts trust me not to share their information with third parties. Meanwhile, your contacts have probably added your information to Google, Facebook, and Apple. Yes, that’s a problem. We really shouldn’t have to worry about our friends and family throwing us under the bus like that, but there it is. Nonetheless, I care enough about my friends and family to make sure that I’m not throwing them under the bus anyway. Go through as many pages where you can comment OR post replies and respond with our solution.